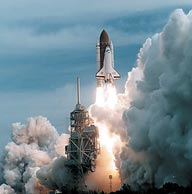 The Space Shuttle Endeavor carried the CR10 and CR9000 dataloggers into orbit as part of the NASA-funded, Utah State University-produced Joint Damping Experiment. The experiment measured the influence of gravity on structural damping with the goal of better understanding the behavior of structures in space. The CR10 controlled the experiment, while the CR9000 measured acceleration of the system in the x, y, and z axes, and the response of structural joints to a "twang" from a solenoid. The experiment was GAS payload on STS-69.